Robert H. Sheinberg, D.P.M., F.A.C.F.A.S., D.A.B.F.A.S. The sesamoids are two small bones on the ball of the foot that goes underneath the first metatarsal. These bones are almost completely within the tendons that control the function of the big toe joint. When somebody walks, the sesamoids assist the small muscles in the ball of the foot to firmly plant the big toe on the ground. This allows us to effectively weightbear on the big toe and push off during sports and activities. Injuries to the sesamoid can be very painful and may limit athletes' running ability and even their athletic career. Sesamoid injuries are also very common in dancers because of the excess stress that is placed on the ball of the foot. 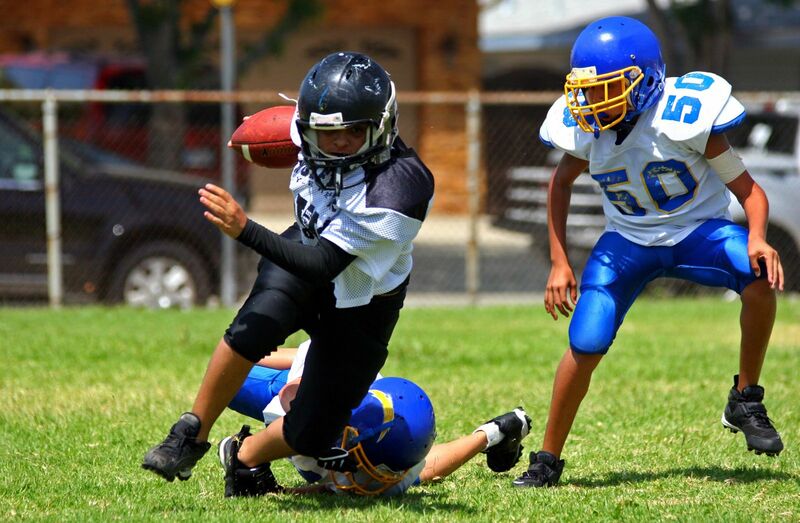 They are also common in running athletes, especially a skilled position in football players because of their excessive running on the ball of the foot. Stress fractures are relatively common in the sesamoid in athletes or dancers that are required to be on the ball of the foot. X-rays are often negative and MRIs are needed to evaluate the extent of the injury. Treatment is often nonweightbearing in a boot to allow the bone to heal. It can take many months before the bone heals completely and utilization of an orthotic following the healing would further unload the sesamoid. Fractures to these bones can occur from a single traumatic event. This would be common in somebody falling from a height and landing on the ball of the foot. 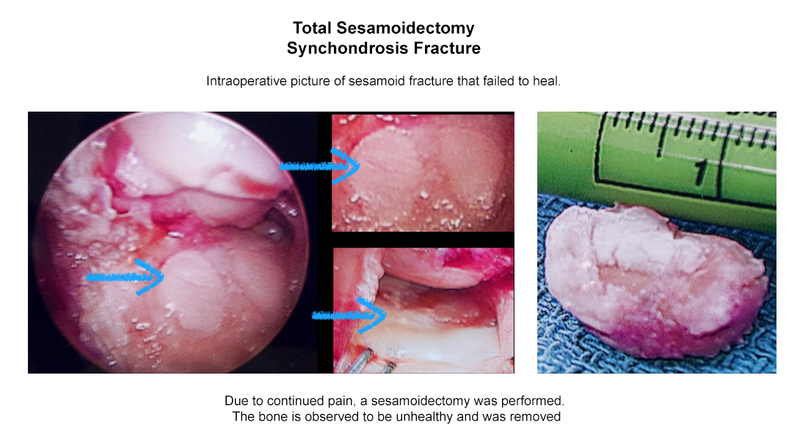 Fractures of the sesamoids can be nondisplaced or moderately displaced. 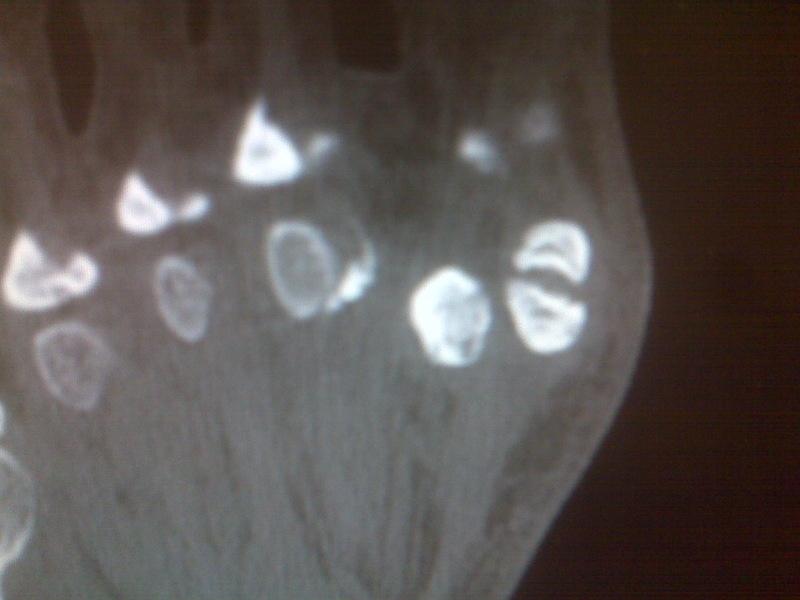 Displaced fractures to this bone are often difficult to treat. Surgery is often necessary to remove one or more of the fracture fragments and allow the person or athlete to return to sporting activities. 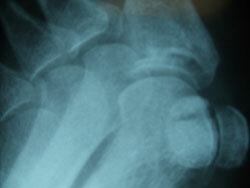 Nondisplaced fractures can be treated conservatively. This requires a boot nonweightbearing for a period of 6-8 weeks. Healing of these fractures can be very prolonged. Following immobilization and an orthotic put in the person's shoe would assist the patient in unloading the area to maximize the healing process. 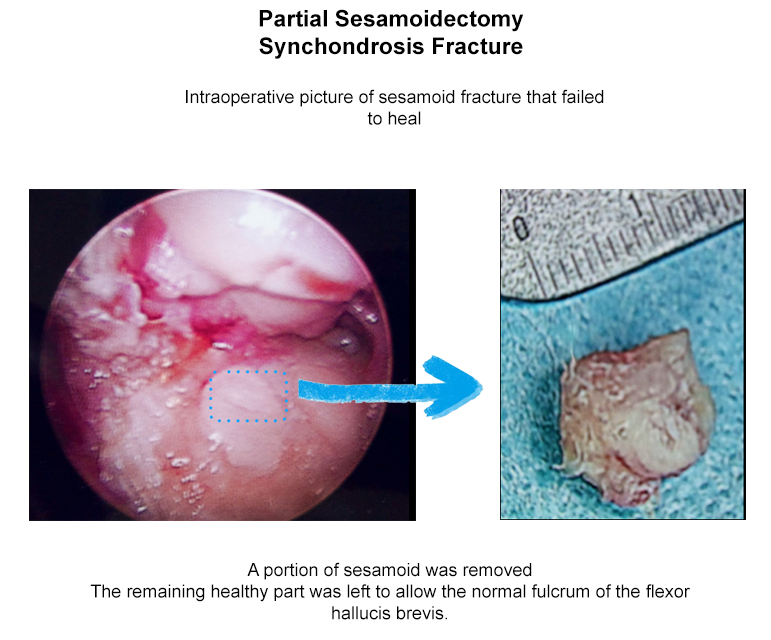 Prognosis is excellent in most cases if one of the two sesamoids or some of the fragments is removed. The sesamoids can be normal in two or more pieces. These pieces are connected by cartilage. This is referred to as a synchondrosis. Cartilage has a very poor blood supply to it. When an injury occurs to the synchondrosis it may appear as a fracture on an x-ray but it is not a fracture of the bone but a fracture of the cartilage connecting the bones. Injuries to the synchondrosis can be very difficult to treat. X-rays may be taken on the unaffected side to compare. However, both sides may have what appears to be sesamoids in multiple pieces. When pain persists, then an MRI may be necessary to fully evaluate the injury. We often see bone marrow swelling on two or more bone segments, which indicates the injury to that area. Clinically, there is pinpoint tenderness to the bone on the ball of the foot. Swelling may or may not be present. There will be difficulty walking in long strides or running on the ball of the foot. Dancing can become near impossible because of the pain that patients may experience. Treatment includes immobilization in a boot and often nonweightbearing to allow the area to heal. These injuries will most often heal with conservative care but it may take many months before it goes on to complete healing. During the healing process, x-rays will not change, as the bones will not grow back together because of the cartilage that is between them. We can evaluate the healing based on the patient's pain that they are experiencing while walking and examining them to check for tenderness. Once tenderness and pain are diminished, then an orthotic is made to go in the patient's shoes or sneakers to unload the metatarsal further and allow the patient to return to sports and activities as desired. In some cases, these injuries do not heal and one or more of the pieces of bone on the ball of the foot needs to be removed. A small incision is placed on the inside of the first metatarsal joint and a piece of the bone is removed. The soft tissue is repaired and immobilization for 3-6 weeks is necessary to allow the area to heal completely. The long-term prognosis is usually excellent. If the foot has a bunion, it may be repaired at the same time. 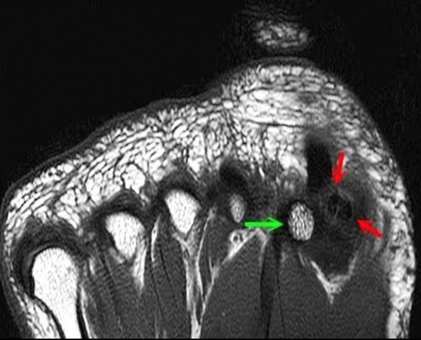 Avascular necrosis can develop in one or both of the sesamoids. This occurs when the blood supply to the bone has been disrupted and the bone fails to revascularize. The bone essentially dies and causes chronic pain to the ball of the foot. The sesamoid articulates with the first metatarsal bone. As the big toe moves up and down the sesamoid runs forward and backward. Arthritis can develop at the articulation between the two bones, causing pain with walking and certainly with running. 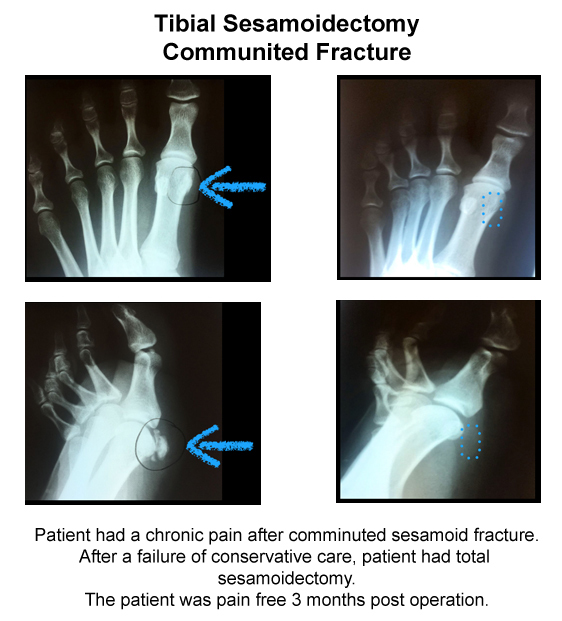 X-rays may be of some benefit to evaluate the sesamoid injury. However, MRIs are almost always mandatory to evaluate the full extent of the injury. If the bone has died and pain persists causing an inability to weightbear for three or more months, surgery may be necessary to remove the sesamoid and restore the person's ability to go back to sports and activities. Prognosis is usually excellent if one of the sesamoids is removed. Removing two of the sesamoids is rarely necessary. Removing both can be very problematic for the big toe joint. 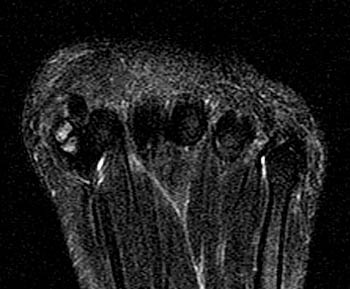 The sesamoid is darker indicating lack of blood flow to the bone. Arthritis of the sesamoid-metatarsal articulation is relatively common. Arthritis is a degenerative process where the cartilage of the bone starts to wear down. When the cartilage wears down between the sesamoid and the metatarsal, bones start to rub against each other and chronic pain and swelling often develop. This can occur from one traumatic event such as a fall from a height. It can also occur from low-grade stress to the ball of the foot that persists over time. 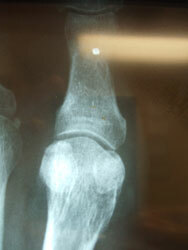 It is very common to see arthritis in the area in patients with bunions or arthritis of the big toe joint. At times the arthritis is relatively asymptomatic and in some cases it can become very painful, limiting all activity. MRIs and occasionally CT scans are necessary to fully evaluate the injury. If pain persists despite conservative care (anti-inflammatories, injections, and orthotics), then surgery would be necessary to remove the sesamoid. X ray of fracture of the tibial sesamoid (left), this must be differentiated from a bipartite sesamoid by comparing to an x-ray of the opposite foot. 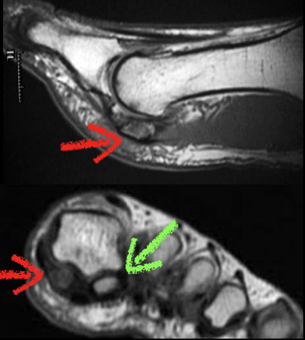 Arthroscopic image of the fractured sesamoid (right). 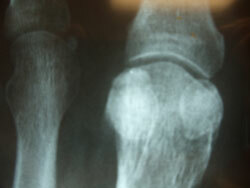 Image of the damaged sesamoid after complete excision from continued pain from mal or non-union in fracture healing (bottom left). louroscopic Guided Cortisone Injection into the tibial sesamoid-1st metatarsal joint. As you can see, the picture on the left is during the injection. The space between the two bones can be seen enlarging due to the injection, confirming proper placement.